Blepharoptosis is defined as the inferior displacement of upper eyelid when the eye is in the primary position. Apart from the cosmetic concern, patients with ptosis suffer from problems in the quality of vision. Some are concerned with the lost superior field, while others may complain about the difficulty in reading due to decrease in the amount of light reaching the macula as well as the increase in drooping of eyelids during downgaze. In children, ptosis is of a major concern as it can cause amblyopia. Ptosis can be an early sign of a life-threatening disease. Early diagnosis and proper evaluation are the important factors aiding treatment of this condition which can improve the quality of life of the people affected. The muscles concerned with elevation of upper eyelid are levator palpebrae superioris (LPS), Muller's muscle, and frontalis. LPS is the major muscle involved which is innervated by the oculomotor nerve (third cranial nerve). The levator originates from the lesser wing of the sphenoid bone. As it traverses the orbit, it broadens and becomes a fibrous aponeurosis that inserts on the anterior aspect of the tarsal plate. The upper eyelid skin crease is formed by attachments of the aponeurosis to the orbicularis muscle and skin. Muller's muscle is a smooth muscle that arises from the undersurface of the levator and inserts into the superior tarsus. The Muller's muscle contributes 1–2 mm of eyelid elevation. Muller's is under sympathetic control and when gets fatigued or dysfunctional, leads to mild ptosis, for examle, Horner's syndrome. The frontalis muscle lifts the brows, and it is innervated by CN VII (facial nerve). Ptosis can be classified as congenital and acquired. According to the etiology, it can be further classified as myogenic, aponeurotic, neurogenic, neuromuscular, mechanical, traumatic, and pseudoptosis. Myogenic ptosis occurs when the muscles elevating the lid are dysfunctional, mainly the levator. Most commonly seen as congenital ptosis where there is LPS dysgenesis. This can occur either as autosomal dominant or as sporadic. Congenital myogenic ptosis is usually unilateral. LPS function may be severely affected in these cases, and they present with a lid lag on down gaze as the LPS fails to relax. Some of them will have associated ipsilateral superior rectus muscle weakness, and some others may have associated craniofacial syndromes such as blepharophimosis syndrome and Marcus Gunn jaw-winking syndrome. Blepharophimosis–ptosis–epicanthus inversus syndrome (BPES) is an autosomal dominant condition characterized by severe bilateral congenital ptosis associated with telecanthus, epicanthus inversus, hypoplasia of the superior orbital rims, horizontal shortening of the eyelids, ear deformities, hypertelorism, and hypoplasia of the nasal bridge. Marcus Gunn Jaw winking is caused by a miscommunication between the third cranial nerve that innervates the levator and the fifth cranial nerve that innervates the muscles of mastication. The result is a unilateral ptosis that improves when the patient opens the mouth or moves the lower jaw in a contralateral direction. The causes of myogenic ptosis in adults include oculopharyngeal dystrophy, chronic progressive external ophthalmoplegia (CPEO), myotonic dystrophy, and infiltrative ptosis. Oculopharyngeal dystrophy patients will have ptosis and associated difficulty in swallowing due to the weakness of oropharyngeal muscles. CPEO presents with bilaterally symmetric ptosis with ophthalmoplegia without any diplopia and may have associated retinal pigmentary abnormalities and cardiac conduction defects. Myotonic dystrophy has an autosomal dominant inheritance and the classical features are ptosis, orbicularis weakness, and extraocular muscle weakness and may also be associated with cardiac conduction defects. Myogenic ptosis can also be caused by infiltrative processes such as amyloidosis which can affect levator as well as extraocular muscles and biopsy of the muscles confirms the diagnosis. Myasthenia gravis is a neuromuscular junction disorder with autoantibodies against acetylcholine receptor causing destruction of them. Ocular myasthenia presents with unilateral or bilateral ptosis with the involvement of extraocular muscles, levator muscle, orbicularis muscle, and without any systemic features. The ptosis usually worsens with fatigue and improves with the ice test and edrophonium test. Other signs include ptosis that worsens in the evening, paradoxical eyelid retraction, and Cogan's lid twitch, which is eyelid retraction that occurs during upgaze after sustained downgaze. Many patients after cataract surgery can develop aponeurotic ptosis. It is thought to be due to trauma to the LPS and superior rectus complex which has strong intermuscuar fascial connections to the levator muscle and can be disrupted either by postcataract eyelid swelling or by the eyelid speculum used to separate the eyelids at the time of surgery. Third nerve palsy and Horner's syndrome are the important causes of neurogenic ptosis. Third nerve palsy can result from vascular/inflammatory/neurotoxic or compressive etiology. It presents with ptosis, extraocular muscle involvement sparing the lateral rectus and superior oblique, down and out eyeball and with or without pupillary involvement (Mydriasis). Trauma can damage LPS muscle/aponeurosis/neural input which results in myogenic/aponeurotic/neurogenic ptosis. Conditions which mimic ptosis include enophthalmos, anophthalmos, dermatochalasis, hypotropia, contralateral lid retraction, contralateral proptosis, facial nerve palsy, superior sulcus deformity, and brow ptosis. Proper examination should be done to differentiate these conditions from that of true ptosis. Family history – Congenital or hereditary ptosis, ocular myopathies, blepharophimosis, etc. The examination of a patient with ptosis should be proper and should aim at confirmation of the diagnosis and decision of treatment. The proper examination of ptosis involves elicitation of signs, lid measurements, and ancillary tests. Anterior segment examination with special emphasis on pupils: pupils affected in Horner's, third nerve palsy, etc. Herring's law-Hering's law of equal innervation states that the reciprocal eye muscle of each eye is innervated equally. As such, manual elevation of the more ptotic eyelid decreases the muscle strength required to keep the lid elevated, and so the contralateral LPS relaxes and causes ptosis in the other eye. Normal: >15 mm lid elevation. Iliff test: It is used to assess levator function in infants. Upper eyelid of the child is everted as the child looks down. If the levator action is good, lid reverts on its own. Pretarsal show: It is an important aspect of finding out the symmetry of eyelids. It is the distance between the lid margin and the skin fold with the eyes in primary position. Corneal sensitivity should be tested in all cases. In children, when there is risk of amblyopia, immediate surgery is needed; otherwise, if there is no risk of amblyopia, we can wait up to 3–5 years of age when we can get more accurate measurements. Upper border of the tarsus is excised with lower part of Muller's muscle and the overlying conjunctiva. Indications are mild congenital or acquired ptosis with good levator function, Horner's syndrome and minor contour adjustment after any ptosis surgery. Bandage Contact lens is placed for 1 week. Complications include corneal abrasion, foreign body sensation, and skin crease lowering. This involves the excision of Muller's muscle and overlying conjunctiva with reattachment of resected edges. This procedure can achieve a maximal elevation of 2–3 mm. 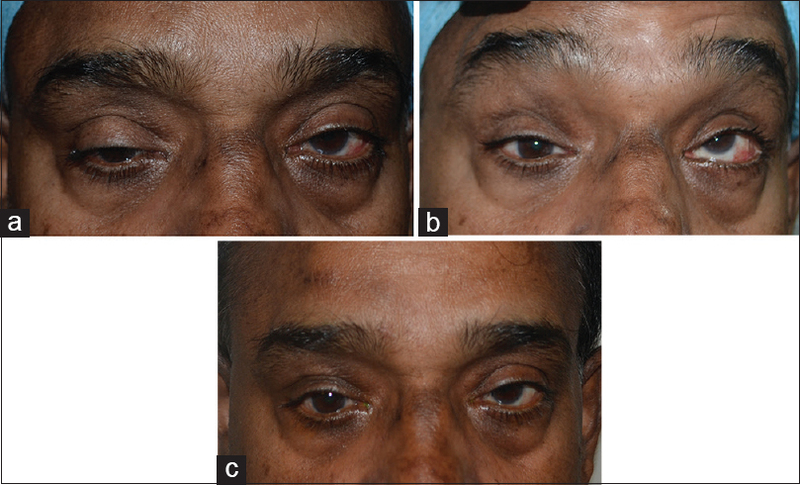 Indication-mild ptosis with good levator function [Figure 1]a and [Figure 1]b. Usually done in Horner's syndrome and mild congenital ptosis. For patients with aponeurosis dehiscence or disinsertion and good levator function, surgery can be done by anterior/posterior approach. For adults, local anesthesia is recommended to be able to adjust lid height with the patient's cooperation. In the aponeurosis surgery by anterior approach, the aponeurosis is approached through a skin incision, it is advanced and sutured to the tarsus, or the aponeurotic defect is repaired directly. Then, the lid contour is assessed with the patient sitting up, once the eyelid height and contour have been verified and symmetry is created, the sutures are trimmed when the desired height is achieved. Excess skin is excised, and skin crease is formed with sutures. This technique is more used when there is aponeurotic weakness with excess skin to be excised [Figure 2]a and [Figure 2]b. Complications include lid level too high or low, contour abnormalities, asymmetrical skin crease, and upper lid show. It can be done in congenital as well as acquired ptosis. Indications: Levator function >4 mm. In the conventional approach, a 20 mm sized horizontal incision is made on the skin, orbicularis dissected; orbital septum opened and under the pad of fat, levator aponeurosis is identified. Then the muscle is resected at the indented height and subsequently advanced up to the middle of the tarsal plate and secured with sutures. Lid crease forming sutures are made. The amount of resection needed is preoperatively determined by the amount of ptosis and the level of LPS function [Table 1]. The lid margin is placed at the superior corneal limbus when levator muscle function is poor to fair, and a postoperative fall of several millimeters is expected. With fair to good function, the lid is placed 2–3 mm below the limbus and no postoperative fall is expected. Such intraoperative adjustment is a useful addition to the quantitative estimation made preoperatively. However, when epinephrine is present in the local, there will be some Muller's muscle stimulation so that a postoperative fall of 1–2 mm is typical. In adult patients, adjustable sutures can be put, which allows postoperative manipulation [Figure 3]a and [Figure 3]b. The frontalis muscle normally elevates the eyebrow and contributes to the eyelid elevation. This eyelid elevation by frontalis is enhanced by connecting frontalis and eyebrow to the upper eyelid using a subcutaneous sling. This surgery is used in patients with ptosis having poor LPS function and good frontalis action. Used primarily in the congenital ptosis with poor levator function, neurogenic ptosis [Figure 4]a,[Figure 4]b,[Figure 4]c, myogenic ptosis and blepharophimosis syndrome., Skin incisions are placed at the tarsus and eyebrow in a fox pentagon pattern to insert the sling material in the suborbicularis plane. The material is placed anterior to the orbital septal plane to raise the eyelid towards the eyebrow. A “hood” can also be formed under the pretarsal and preseptal skin, delaying eyelid lowering in downgaze. Sling materials can be autogenous (fascia lata, temporalis fascia) or nonautogenous. Nonautogenous can be integratable (Mersilene mesh, Gortex) and nonintegratable (prolene, silicone). The patient should be at least 3-year-old for sufficient leg size for removing an appropriate fascia. Autogenous fascia lata is the best sling material, and the disadvantage is that it has to be harvested. Hence, it is not used in very young children (<3 years) and very old or debilitated persons. There is less risk of infection, absorption or rupture as compared to the foreign materials. Whenever possible, all the ptosis surgeries should be performed under local anesthesia to allow for the precise adjustment of lid height and contour. In cooperative children, local anesthesia can be used in children as early as 12 years of age. Complications of the surgery include undercorrection, overcorrection, corneal exposure, infection, sling granuloma [Figure 5], and notching of the eyelid. Proper evaluation is necessary in deciding the correct management of ptosis. The choice of treatment is mainly dependent on the amount of ptosis and level of LPS function. The accurate measurement and a meticulous surgery will always give you good results and a happy patient. Sudhakar P, Vu Q, Kosoko-Lasaki O, Palmer M. Upper eyelid ptosis revisited. Am J Clin Med 2009;6:5-13. Collin J. A Manual of Systematic Eyelid Surgery. 3rd ed. Oxford: Butterworth-Heinemann Elsevier; 2006. p. 85-113. Edmonson BC, Wulc AE. Ptosis evaluation and management. Otolaryngol Clin North Am 2005;38:921-46. Cantor L, Rapuano C, Cioffi G. Orbit, Eyelids, and Lacrimal System, 2016-2017 edition. Washington, D.C.: American Academy of Ophthalmology. 2016. p. 173-9. Zoumalan CI, Lisman RD. Evaluation and management of unilateral ptosis and avoiding contralateral ptosis. Aesthet Surg J 2010;30:320-8. Waller RR, McCord CD, Tanenbaum M. Evaluation and management of the ptosis patient. In Oculoplastic Surgery. New York: Raven Press; 1987. 325-75. Betharia SM, Grover AK, Kalra BR. The fasanella-servat operation: A modified simple technique with quantitative approach. Br J Ophthalmol 1983;67:58-60. Pang NK, Newsom RW, Oestreicher JH, Chung HT, Harvey JT. Fasanella-servat procedure: Indications, efficacy, and complications. Can J Ophthalmol 2008;43:84-8. Sajja K, Putterman AM. Müller's muscle conjunctival resection ptosis repair in the aesthetic patient. Saudi J Ophthalmol 2011;25:51-60. Baldwin HC, Bhagey J, Khooshabeh R. Open sky müller muscle-conjunctival resection in phenylephrine test-negative blepharoptosis patients. Ophthalmic Plast Reconstr Surg 2005;21:276-80. Oh LJ, Wong E, Bae S, Tsirbas A. Closed posterior levator advancement in severe ptosis. Plast Reconstr Surg Glob Open 2018;6:e1781. Bartley GB, Lowry JC, Hodge DO. Results of levator-advancement blepharoptosis repair using a standard protocol: Effect of epinephrine-induced eyelid position change. Trans Am Ophthalmol Soc 1996;94:165-73. Yang JW. Management of senile ptosis with levator muscle resection using the putterman clamp. Plast Reconstr Surg Glob Open 2016;4:e726. Daoudi C, Chahdi KO, Lezrek O, Karim A, Daoudi R. Whitnall's ligament suspension technique in ptosis surgery. J Fr Ophtalmol 2017;40:763-9. Ibrahim HA, Sabry HN. The use of whitnall's ligament for sling redirection in frontalis suspension ptosis surgery. Ophthalmic Plast Reconstr Surg 2015;31:53-7. Petroni S, Capozzi P, Parrilla R, Zinzanella G, Buzzonetti L. Surgical treatment of severe congenital ptosis using deep temporal fascia. Orbit 2018;12:1-5. Balaji SM. Efficacy of autogenous fascia lata and silicone aurosling in correction of congenital blepharoptosis by frontalis suspension. Indian J Dent Res 2018;29:166-70. Beyer-Machule CK. Congenital ptosis and complications of ptosis surgery. Plast Reconstr Surg 1988;81:789-99. Collin JR. Complications of ptosis surgery and their management: A review. J R Soc Med 1979;72:25-6.